Conservation laws are one of the overarching themes of science. Many science teaching standards and curricula require students to master conservation laws, and use them to explain phenomena and make predictions. Next Generation Science Standard HS-PS1-7 requires that students demonstrate understanding that the total amount of mass does not change during chemical reactions. In this post, we’ll look at some of the common ways to teach conservation of mass during chemical reactions, explore some problems teachers have experienced, and suggest two ways to improve results: a simple demo and an activity in Pivot Interactives. A common activity to introduce this topic is to conduct a reaction on an electronic balance to show the the mass of the reactants is the same as the mass of the products. For example, students put vinegar into a flask on a scale. Then they add baking soda to a balloon and stretch it over the flask mouth. 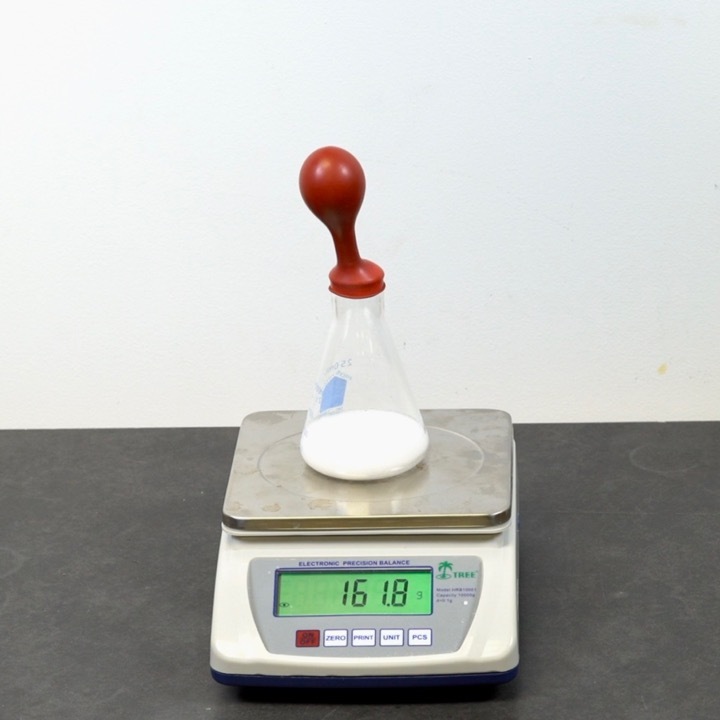 After recording the scale reading, they move the balloon to dump the baking soda into the flask, starting a chemical reaction. Students watch as the balloon expands, and then record the new scale reading when the reaction stops. Many teachers report that the scale reading decreases even though the mass should remain the same. Vinegar is placed in a flask, and sealed with a balloon containing baking soda.
. The balloon is lifted, dumping the baking soda into the vinegar. As the reaction begins, carbon dioxide begins to fill the balloon. Note the scale reading at this point. As the reaction progresses, carbon dioxide inflates the balloon. Notice that the scale reading has decrease, even though nothing leaked out of the beaker. We created an activity in Pivot Interactives that allows students to explore this phenomena and discover that the decreased scale reading is caused by increased buoyant force on the flask and balloon. Here’s what they’ll see. Students will select from multiple examples, some where the volume increases, others where it decreases, and even one where the volume both increases and then decreases. They’ll see that the change in scale reading depends on the volume change. If the volume increases, the scale reading decreases and vice-versa. After making this connection, students will see a short introduction to the concept of buoyancy. They’ll learn that when you place an object on a scale, the scale reading is not the mass object, or even the force of gravity acting on the object. Instead, the reading shows the amount of force the scale exerts to keep the object in place, expressed in grams. But any object placed on a scale also displaces air, and so an upward buoyant force, equal to the force of gravity on the displaced air, is also exerted on the object . The upward buoyant force causes the scale reading to be slightly less than the force of gravity on the object. The larger the object, the more air it displaces, and the greater the buoyant force exerted on the object. During the chemical reaction shown in the pictures above carbon dioxide gas is one of the products of the reaction. When the gas is released, the volume of the system increases, even though the mass does not. This increase in the volume of the system means that the system now displaces more air, causing a greater buoyant force, and a decreased scale reading. The density of air is 1.22 kilogram per cubic meter. This means that one cubic centimeter of air has a mass of 1.22 milligrams. If the balloon inflates to a 5 cm radius, it will have a volume of about 520 ml. This displaces about 0.6 grams of air, causing a buoyant force that is reflected as a 0.6 gram decrease in the scale reading. Under most conditions the effect of the buoyant force is too small to be noticeable when measuring mass. When measuring the mass of water for instance, the buoyant force is only 0.12% of the mass — a deviation that is usually negligible. But when the volume of the object changes significantly during the measurement, we can clearly see the effect of the buoyant force. This video shows a flask with a about 5 ml of water, sealed with a balloon and placed on a hot plate. When the water boils, the balloon inflates. 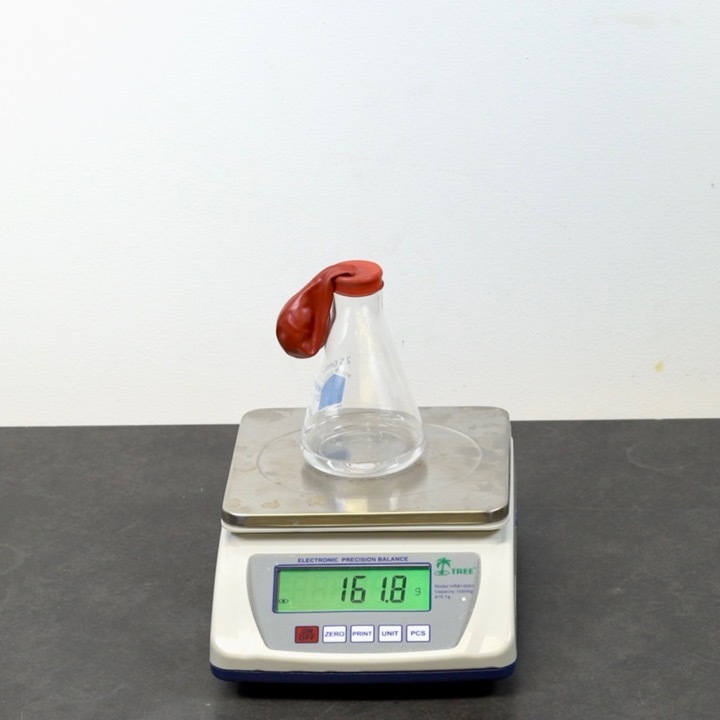 The flask and beaker are then placed on a scale. Watch the scale reading as the balloon deflates. Compare the reading before and after boiling to confirm that the balloon was well sealed. This video shows a balloon filled with air, placed in liquid nitrogen. The balloon shrinks as the volume of the air decreases and then condenses to liquid. Then, the balloon is placed on the scale. As it warms, the air inside expands back to its original volume. Observe the reading on the scale as the balloon warms. 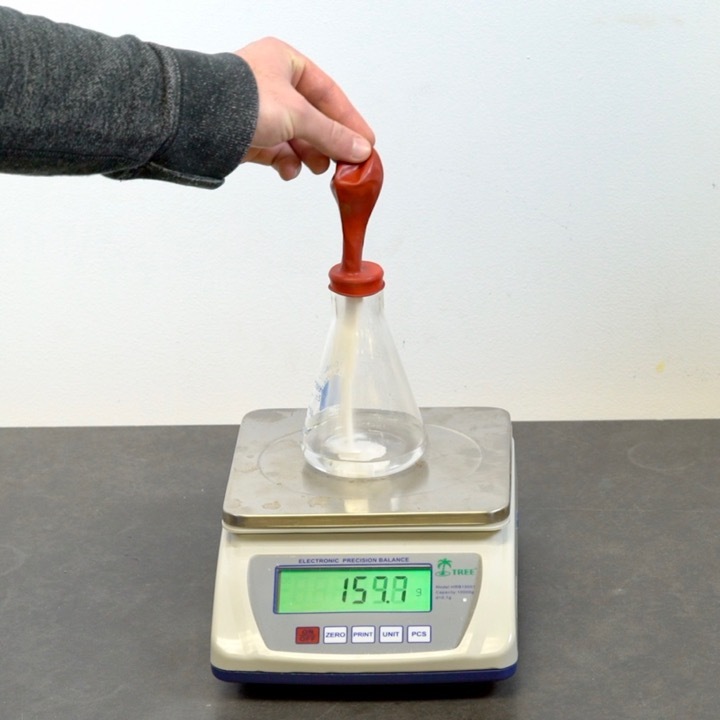 While this activity and these videos will help explain why the scale reading changes when the volume changes, they are not useful for showing evidence of conservation of mass during chemical reactions. To show that the mass of the system doesn’t change, you need to conduct the reaction in a container that keeps the volume constant during the reaction. During a discussion on the Facebook NGSS Chemistry Teachers group, teacher Nomita Ramchandani suggested using a gatorade bottle to keep the volume constant. You can put vinegar in the bottom of this plastic bottle, dump the baking soda in and quickly screw on the cap. Some baking soda may spill out, and also the reaction will begin before the lid is screwed on tight. 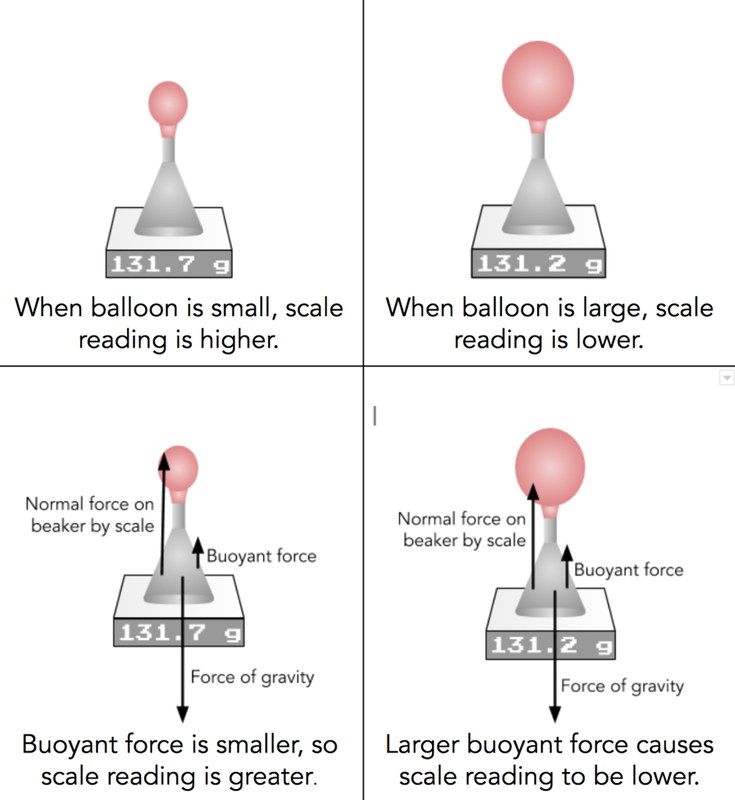 Both of these will cause the mass of the system to decrease slightly, but in a way that is easier for students to understand than the decrease in scale reading due to buoyant force. To make a convincing experience that shows conservation of mass during chemical reactions, we made several interactive video sets for students to explore in Pivot Interactives. We constructed an air-tight container with constant volume. We made the container large enough that we can place a scale inside the container, so students can observe mass changes inside the container. In addition, we placed the entire container on another scale so students can see the changes in the total system mass. This apparatus lets students measure changes of mass of the solids and liquids in the reaction, but also measure the mass of the entire system. In the photo above, students make measurements of mass changes for the “Elephant Toothpaste” reaction, but the Pivot Interactives activity also allows students to explore burning steel wool, and to see how that reaction differs in the presence of different gases, oxygen, carbon dioxide, and air. The activities using these videos allow students to measure the changes of mass inside and outside the container for several different chemical reactions. The picture above shows the popular “Elephant Toothpaste” reaction between hydrogen peroxide and potassium iodide. We used another classic, shown below: burning steel wool. In this example students can measure the changes in mass, but also change the gas inside the container. They can observe the reaction with air, pure carbon dioxide gas, or pure oxygen gas inside the container. Using evidence from these reactions, students can develop and evaluate competing explanations using Eugenia Etkina’s ISLE cycle. You can see the activity (usable, but still being refined) here. This apparatus lets students measure the changes of mass of the steel wool inside the container, and also the changes in overall system mass. Students can select which gas is inside the container: air, carbon dioxide, or pure oxygen. They can see how these different gases affect the changes in the scale readings.